Fair vacation management is now possible with Humanity's state-of-art employee scheduling software. Humanity has a lot of features to offer and we are aware that fair vacation scheduling and staff availability are two features that you value. Vacation and availability are two of the challenges that a scheduler must face to create a functional work schedule. Now, I’ll explain each Vacation/Availability Setting in the Humanity application. 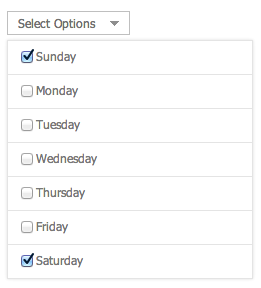 If this option is checked, it allows your employees to have the option to set their ‘Weekly Availability’ times. By default, this feature is enabled. This option allows you to select certain days to noted as a “weekend” and not count towards employee vacation day count. For example, if your business does not count Sundays and Saturdays toward employee vacation time, select these two days in this field. If an employee requested vacation time from Thursday to Monday, their vacation count will only be counted as 3 days. If this option is selected, it will enable your employees to set ‘Future Availability’. It allows them to set staff availability for future one-time events and meetings that prevent work that day. By default, this feature is enabled. NOTE: If this event is a recurring event, we recommend you use ‘Weekly Availability’ instead. The scheduling feature defaults to what is set for the weekly staff availability and then allows the ‘Future Availability’ option to override those settings for each individual day. If this option is checked, it requires managerial approval before employees can finalize changes made to their ‘Weekly Availability’ and ‘Future Availability’. By default, this feature is disabled. 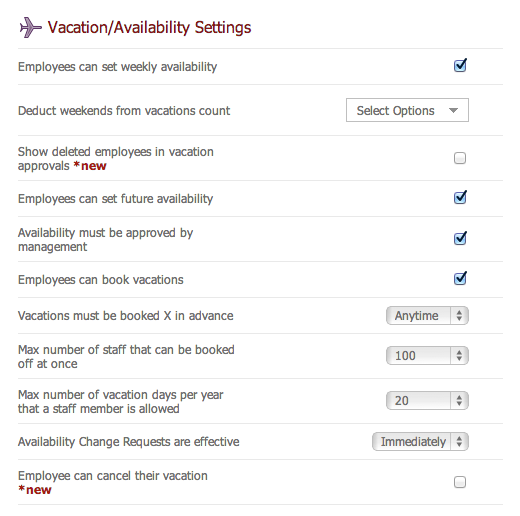 If this option is selected, employees will be able to request vacation time through the system. By default, this feature is enabled. This option requires employees to request vacation time in advance. It varies from anytime to 3 months prior to vacation. By default, it is set to 1 week prior to the vacation day. This will only allow X number of employees to be on vacation at the same time. By default, it is set to allow 10 employees to have vacations at the same time. This value can go from 1 staff member to 100 staff members. This option sets the maximum number of vacation days per year that an employee is allowed to take. By default, this field is set at 12 vacation days per year. Here you can set the effective date for when your staff availability changes will become effective. By default, this is set at immediately. Fair vacation management is now possible with Humanity’s state-of-art employee scheduling software.